26 November 2017, Shabat Surati Sangam Ashram, Malke, Moga: We might not ever forget the impact of the choice words chosen by someone a decade ago. But if a saintly person advises or shares the secrets of his inner journey, we tend to forget it before the tick of an hourglass. Why, because we choose! 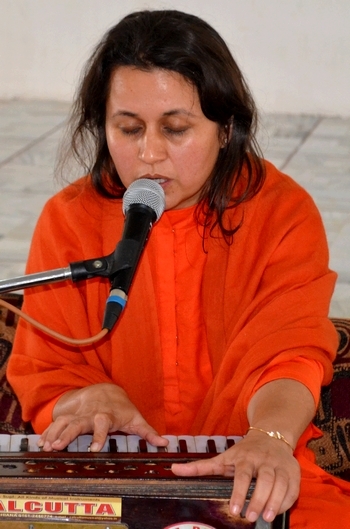 How, lets find out through the discourse of Sadhvi Ji from the last Sunday satsang–sabha of this month! Surrender – We talk all about it, but when it comes to doing we are tied in deep wells of desires on the name of necessities. Problem is, we do not know what needs to be surrendered. No matter how-much-so-ever success kisses our very feet, it is only the wealth of practicing Guru-mantra that is bound to make a trip along us. And yet we choose pain over pleasure. That’s right. We choose! We have a mine of jewels buried beneath our floor and yet just because we are bankrupt on papers, we fall apart; isn’t that being foolish on our part? Just the way, source of joy is enclosed within each and every one of us. We prepare before we are to go somewhere. But we have neither done nor doing any preparation for our real home; for the sole reason – we have no plans of going there anytime sooner. For instance, if we get to know that walls surrounding us are about to explode any minute, would we stay there? No, right! This body is bound to decay one day, and yet we choose to stay as long as it actually doesn’t explode. We are busy in wanting to or becoming a master of those around us. However, deep-within we are scared of something inevitable, the death. Understand this, no one would give a damn once we are dead. We are friends with every other person we get introduced to but the real friend, the only and ever-lasting friendship we can have is with Him, and His symbolic we fondly call as Guru; how, by taking maybe slow but steady steps directing us towards Him.